What is long-term, permanent marketing and how can it help your Eikaiwa grow? Any business that wants to succeed and grow must consider several ways of marketing and advertising their products to get new customers. There is an abundant amount of valuable information on marketing theory on the internet, but this article will explain the benefits of long-term (permanent) marketing campaigns for Eikaiwa schools in Japan. After that, we will look at some examples that have been effectively used to promote my English school in Japan, Step by Step Eikaiwa. The main advantage that long-term marketing campaigns have over short-term, temporary campaigns is that they never stop advertising your school and brand, and therefore have potential for getting an endless number of new students. Considering the cost-effectiveness (in terms of Return on Investment ROI, Return on Advertising Spend ROAS, or return on Marketing Investment ROMI), the revenue continues to grow over time with a single, fixed expenditure of time or money. Let’s consider two types of marketing campaigns that are regularly used by Eikaiwa schools in Japan: flyers and signage. Let’s say you print and distribute 10,000 flyers for the cost of $1,000 and get one student who pays $100 per month for five years. The revenue for this scenario is $6000, which means you profit $5000 and increase your initial investment of $1000 five times over five years. The ROI/ROMI/ROAS formulas give 500%. Next, let’s consider a permanent form of advertising such as a sign. If you make a sign for the same cost, $1000, and you can get one new student per year from this sign, then assuming the same conditions from above, the return on investment for 5 years is much greater. In the first year the new student will pay for 5 years, in the second year the new student will pay for 4 years, down to the fifth year student who will pay for 1 year in the 5-year calculation. The formula then gives 1,700%. This means that you have increased your reinvestment of $1,000 17 times in five years. This is clearly the favorable method of the two. Technically a sign isn’t permanent because of they need to replace the sign after roughly 10 years due to fading from sunlight and weather damage. But assuming we have an invincible sign which never needs replacing, let’s consider the above examples over a longer period. With the temporary flyer example over a 10-year period, the student who joined and quit after 5 years no longer generates revenue for the school, and there is no way to get new students after the campaign. So, the return on investment is fixed at 500%. The return on the investment for the sign over 10 years, 15 years, 20 years is 4,700%, 7,700%, and 10,700%, respectively. (This accounts for 1 student quitting each year after the fifth year.) Of course, there are several factors that must be considered including effectiveness of the campaign, but in this theoretical model, it’s clear why long-term (permanent) forms of marketing and are desirable in the long run. Before we look at some examples of long-term marketing ideas, it’s best to understand the difference between direct marketing and indirect marketing. Direct marketing is exactly what it sounds like. You try to advertise and sell your product directly to a customer. In terms of Eikaiwa, this could be a campaign flyer advertising new English classes, a TV commercial, or your website explaining the benefits of your classes and why people should study English at your school. Indirect marketing, however, is the opposite. You don’t try to sell your customer anything. Instead you try to do something that strengthens your brand identity or builds a relationship with potential customers. There are several forms of indirect marketing, but for the purposes of this article, we will focus marketing strategies which offer some kind of free information or service that your potential students find useful or super cool (buzzworthy). There are many examples of direct marketing which are permanent or long-term such as signage, but here we will primarily focus on examples of long-term, permanent marking which are indirect. Without a doubt word-of-mouth advertising is the most cost-effective form of advertising because it’s 100% free. Word-of-mouth advertising can actually be used as a form of direct or indirect marketing. If somebody likes your product, your English lessons, and they talk about it, you get new students. This would be direct word-of-mouth marketing. On the other hand, if you did volunteer service through your school and people were talking about that, then they are promoting your school and brand without talking about your actual product. This is a form of indirect word-of-mouth marketing. To get the most from word-of-mouth advertising, making sure your product is the highest possible quality is the best way to get word-of-mouth advertising. 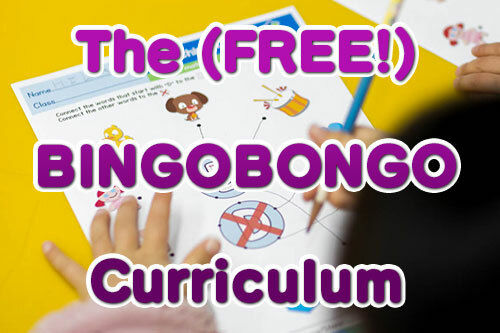 We developed the BINGOBONGO Curriculum exactly for this purpose. It’s not only effective for getting students to speak and communicate confidently, but English schools who use the free curriculum can tell parents that students will be able to pass EIKEN 5 by the age of 10 years old. We also wanted to make sure the parents could see student progress through evaluation methods other than testing, so we created the A.S.K. Profile Cards and curriculum cards. These let parents easily see their children’s progress leading to increased word-of-mouth advertising. Of course, your school website plays a vital role as a long-term, direct marketing tool. What many schools don’t do, however, is effectively use their blog as a long-term, indirect marketing tool to get discovered through organic internet searches. Most schools will find that there are peak seasons when their website’s content is viewed the most. Between February and May, when many children’s parents are looking for new extracurricular activities for the new school year, is probably the main peak season for eikaiwa schools that offer kids classes. Most schools have built their websites to perform well for searches with keywords such as, “(your town name),” and “English conversation school.” Unfortunately, every other English school in your area is also competing for these same keywords, so the effectiveness of those keywords can be diminished. Not to mention that those keywords have little value outside of the peak sign-up season. So, what should a school do outside of these peaks seasons? A high-quality blog with well-written articles offering useful, free information is an effective way to implement long-term, indirect marketing. Think about some information that your target market might be searching for, research it, and write about it. For example, mothers with infants might be looking for free activities to enjoy with their babies. Or maybe people are going to join speech contest and want to learn how to write a good English speech or how to practice to win. By writing a quality blog following good SEO guidelines, people searching for information will indirectly find your school/brand and remember it if your blog provides them with the information they were seeking. They may not sign up immediately, but they might join at some point or tell a friend about it. Another useful way to use your blog is as a record of all your other offline, indirect marketing campaigns or activities done in the community. Doing volunteer work or projects that promote and improve your community can get picked up by newspapers or make it on TV, so it’s important to write a summary and archive it. This will let people who read your blog, after finding it directly or indirectly, learn more about you and your brand. Any kind of volunteer work such as a beach or park clean-up, giving out free Christmas presents as Santa in hospitals, a free translation/interpreting service, starting a fundraiser or something to promote tourism in your area are all great ways to make a difference and get some positive attention to your eikaiwa. And it inevitably leads to more word-of-mouth advertising or new opportunities to promote your school and your product. Mass media appearances also tend to have a chain reaction effect leading to other appearances in different forms of mass media. Most cities and municipalities in Japan have a press club. If you have something that you want them to consider, simply write a press release and deliver it to them. It also helps to try to get the contact information of someone working in the media. I was able to get the business card of a newspaper reporter in the area and have been able to directly contact him with new projects we hope to see reported in the newspaper. Turning your hobbies and interests into powerful, long-term marketing tools is easier than you think. I have done several projects based on my interests and hobbies which have been featured in newspapers (Sanuki udon poster in the Japan Times), magazines, and other print media, as well as on the evening news, cable TV, TV shows, blogs and more. An aerial photo book of my prefecture (My Little Kagawa), a free guide poster for Sanuki udon distributed to over 400 udon shops in the prefecture, and a song/ music video about Sanuki udon have been featured in multiple forms of mass media, one after another in a chain reaction. If you have any specific skills, passions or hobbies, try using them as a form of permanent marketing. Of course, the key is to follow the guidelines stated above, and create something free, useful or buzz-worthy that can give back to the community. If you like photography maybe you can make a photo book or have a photo exhibition somewhere in your community. My photo book has been featured in mass media over 15 times because I, a foreigner in the prefecture, was trying to share my experience with local residents and promote the beauty of the prefecture to others around the world. If you love cooking, for example, maybe you can volunteer and set up a free cooking class in a community center. If you love watching movies, you could set up a free movie night somewhere in your community. Do you like drinking beer or wine? How about a tasting event or an English pub quiz with a local restaurant or bar. Although volunteering and offering free events/services requires time and money, it’s worth it if you think about as a long-term marketing expense. So go out and try to do something buzzworthy. If you feel like your lacking the skills or resources to carry out a project that you have in mind, teaming up with someone else in the community can have impressive results. Most of the projects I have mentioned above have required some assistance from others on my team at Step by Step or within the community. I certainly can’t fly a plane, but I suggested the My Little Kagawa project with a business acquaintance who was also a pilot. The English Guide to Sanuki Udon poster was largely possible because I asked a teacher with a passion for art at Step by Step Eikaiwa to help with the illustrations. The key to a successful project is to constantly make connections with people in your community. The more you branch out and network, the more you will be able to team up and improve your community. And the more people involved in the project, the more buzz you can generate. What’s the best form of indirect, long-term marketing for your eikaiwa school? The best kind of long-term marketing campaign for your eikaiwa is something that only you can think of. By using your interests, passions, and ideas, you can create a unique, long-term marketing campaign that highlights the personality of brand. Plus it’s hard copy or imitate something only you can come up with. With that said, there is no right or wrong way to market your school, so as long as you are having fun and offering something free, useful, and awesome which gives back to your community, you can’t go wrong. If you’re going to put in the time and money, it’s preferable to have forms of marketing with a longer lasting impact on your school’s brand. One way to start generating ideas is to search google for newspaper articles about volunteer work done by locals in their communities and see if there’s something similar you can do. Be sure to check out these other great articles on building your own English curriculum and mistakes to avoid when starting an eikaiwa English school in Japan. Jeremy is the founder and director of BINGOBONGO Learning and Step by Step Eikaiwa in Kagawa Prefecture, Japan. He is also the creator of the Stagger-Repeat Teaching Method (START Method). Unable to find adequate teaching resources to meet his high standards of education, he decided to build his own English education resources from scratch to help his students learn English and become confident communicators. Jeremy regularly gives presentations and workshops around Japan. He has also shared many of his ideas and experiences with numerous people through podcasts. You can hear selected podcasts below or check the following schedule of upcoming events and presentations to find out more.